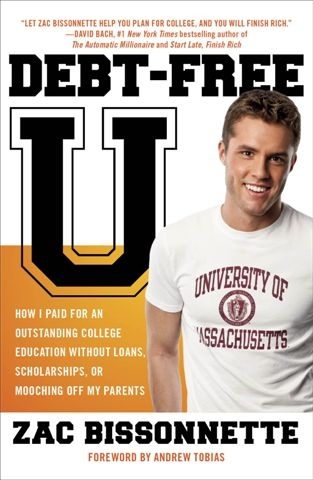 Debt-Free U: How I Paid for an Outstanding College Education Without Loans, Scholarships, or Mooching off My Parents — So many people think it’s almost impossible to go to college without incurring debt. Zac Bissonette debunks this myth and shows you how it’s possible to pay cash for college without having to take twenty years or make six figures (or without parents having to cash in their 401Ks to pull it off). The book promises it might save you $100,000 and I think it very well could. Despite what some may tell you, college doesn’t have to cost two arms and two legs. I know many, many young people who have gone to college and graduate school without debt and wholeheartedly believe it’s much more possible than most people realize. Zac does a huge service to families everywhere in this well-written, much-needed book. You might disagree with some of his conclusions or suggestions, but I promise he’ll make you think and re-examine your beliefs regarding college and debt. If you are planning to go to college at some point in the future or have children who are planning to go to college, you must read this book. Honey for a Child’s Heart — I really enjoyed this book. As some of you know, I’m not a huge fan of fiction for a variety of reasons (mostly because I like real-life stuff and just can’t seem to get into fiction knowing that it’s been made up — especially when I have lots of other books I really, really want to read!). However, this book challenged some of my long held opinions on fiction and helped me think of it in a new light. I didn’t agree with all of the authors conclusions on books we should read to our children, but I was inspired to continue to make reading a big part of our lives and to encourage my children to love good books. I also loved the book lists at the back of the book and added dozens of them to our long to-read list! The Wounded Spirit — I read this book based upon Ann Voskamp’s recommendation. While I actually didn’t love Peretti’s writing style like I thought I would (I think I’ve only read one other book by him before), this book had some excellent gems in it. I was especially challenged to realize how much my words can effect others and how important it is for me to be careful to do my best to only say words that build up and encourage my children, my husband and all those I come in contact with. By the way, if you missed it, be sure to read Ann’s poignant post on this topic. The Treasure Principle — I loved this book. It was short, concise, thought-provoking and all around excellent. If you’re a Christian struggling with what Biblical stewardship entails, this book will definitely encourage and challenge you. This book is well worth your time. The Happiness Project — I was planning to read Three Cups of Tea this month, but after I was made aware of a lot of controversy over the book, I decided to replace it with The Happiness Project. This book is not my usual type of reading material and I really didn’t expect to like it, but some various friends of mine recommended it, so I read it. And I’m glad I did! While I believe that the only way to experience true, lasting fulfillment and happiness in life is to live one’s life for Christ, this book made me re-examine my life and why I do what I do each day. I definitely disagreed wholeheartedly with some of the author’s conclusions, but I was inspired to think of small changes I can implement in my life to make our home and lives run more smoothly and cheerfully. Sometimes, it’s just a matter of choosing to sing in the morning instead of complain over a long to-do list and spilled milk! Read aloud to the children: Little Town on the Prairie, All of a Kind Family, Voyage With the Vikings, and Attack at the Arena. We thoroughly enjoyed all of these, though I’d say the Adventures in Odyssey books were definitely their favorites. What books did you read in June? Any great recommendations for me to add to my to-read list? I am so the opposite of you. When I read, I totally do it for escapism so I am a BIG fiction fan. That said, I do need to work some of the titles above into my To-Read list (which is miles and miles long). Thanks for sharing your reading list. It’s very inspirational! I LOVE The Wounded Spirit. And what I love most is that it is Frank Peretti’s real life experience. As a teacher, it has helped me help my students love each other in a real way, despite each other’s differences-whether outward or inward. I also enjoy Peretti’s fiction as well. Do you ever read Christian fiction? I love the historical romance Christian novels. Also, Lori Wick is an outstanding Christian novelist. You might give her a try if you’re trying some new fiction. I rarely read fiction, but I’ve been trying to break out of that pattern a little. So far, I still really dislike fiction, but maybe someday I’ll be able to enjoy it! If you haven’t read Made to Crave by Lysa TerKeurst, I highly recommend it! There is also a series of books called Christian Heroes: Then & Now. I read the book about George Muller and was very inspired by his life and faith. Just wanted to let you know that the link for The Happiness Project actually takes you to a page for Honey for a Child’s Heart. Looking forward to reading both though! Crystal, my husband wasn’t a huge fan of fiction before we were married He had bookshelevs filled with biographies and history. Reading the Little House books out loud (though those are not exactly fiction) to my daughter, with him in the room, changed that idea. He thought that perhaps it might be okay to try some fiction. He wondered what to read first. I handed him the best book for him 🙂 The Red Keep. It’s such a fantastic read, with adventure, history, mystery, and lots of action (it starts with an action scene!). I highly recommend it to reluctant fiction readers! The little house books are indeed fiction or literature based on a true story. If you read “The Ghost in the Little House,” a biography of Rose Wilder Lane, you learn that Laura and Rose, working together, took many liberties with the actual events in order to serve the demands of literary pacing and the points that they (especially Rose) wanted to make. One notable departure from the truth: The fact that Mary attended college for the blind paid for by Dakota territory. That didn’t gel with the authors’ presentation of the Ingalls family as totally self-reliant. Very interesting on Mary’s college being paid for by Dakota territory! Now I want to read the Ghost in the Little House. Would you recommend it? Yes, it is a great biography. Rose was a very interesting woman! Some of it I didn’t want to hear because it changed my perspective on my beloved Little House books, but still … worth reading. I don’t like Ghost in Little House;) I read most of it but Rose isn’t my favorite person ever;). Caddie Woodlawn is done in a similar fashion, if you haven’t read it. There is another book, too (Caddie Woodlawn’s family). There were written by the granddaughter, however, unlike Laura’s writing about herself (Carol Ryrie Brinks wrote down the stories that Caddie told her about her life). Much more historical fiction than biography are the books about Laura Ingalls Wilder’s ancestors; Melissa Wiley (the author of the Martha and Charlotte books) tells more about them here on her blog: http://melissawiley.blogspot.com/ I wasn’t sure about reading these at first, but after reading the research that went into them, I did, and I’m so glad I did; they are fantastic! My parents were kind enough to take me to the Wilder homestead in Misssouri when I was around 11. Several years back my parents visited the house in South Dakota. What a wonderful legacy we have from Laura of a a very changing time. As an adult, my favorite book is Farmer Boy. I would reread the other books as a child, but not Farmer Boy. Now, I love it! My husband was skeptical that he would enjoy it, but he learned a lot from reading Farmer Boy. I loved Caddie Woodlawn as a girl and didn’t realize it was based on real people. I am planning to read it to my girls sometime soon — if I can get their attention back to a nice “bonnet” book now that their dad has introduced them to a certain popular series of very fat and exciting kids’ books that I won’t name here. Farmer Boy was the only one of the Little House books that I really loved as a child, and now it’s my kids’ favorite, too. Thank you for recommendations on books you’ve read– always love to know what others are reading! I would recommend two books I read this month. The first is by one of my newest favorite fiction writers, Joel Rosenberg– he is a Christian writer who reminds me of Grisham. The book is The Twelth Immam. Would also recommend a small, easy read book called Loving the Little Years: Motherhood in the Trenches. Excellent book from a Christian mom, fellow blogger named Rachel Jankovic. REally good and very inspirational. I loved the Happiness Project and even started my own project with two good friends. The book isn’t written from a Christian perspective, but I also enjoyed it very much and am on my second reading. I’m finding that the daily accountability of the resolution charts is really helpful. It seems like you think of most fiction as “fluff” and for entertainment purposes only which seems somewhat short-sighted and dismissive. Certainly there is plenty of fiction that is “light” in content and easy to read—there is nothing wrong with this sort of literature, there are times that we need writing that is simply entertaining or distracting. But much fiction is not that kind of light reading. Rather, it can illuminate the depths of the human condition, stretch our intellectual boundaries, and allow us to learn and experience those things that we don’t or can’t encounter in our own lives, giving us information to weigh and balance with those things we know firsthand. Those benefits are just as useful and practical as those gained from how-to manuals and inspirational texts. Just to clarify since I’m guessing you’re new here and haven’t read some of the discussions we’ve had in the comments regarding fiction: I don’t think of all fiction as fluff, though I would say much of it is more for entertainment purposes than most how-to books would be. However, there is fluff non-fiction and fiction alike, in my opinion. I do like good movies, though, so you’d think I’d like good fiction. But so far, I just haven’t been able to get into it. I admire people who can read great classics with such passion! Crystal, I agree with you! I used to LOVE good fiction, and read it often… too often, to the point that I was neglecting other things I needed to do in order to read. I knew I needed a dramatic change, so I decided to ban all fiction from my personal reading life (I still read fiction to my children, but no longer read fiction novels to myself). This self-imposed ban lasted for about two years, until I decided I could pick up a novel and enjoy it without allowing reading to take over my life. I read the type of book I used to love (historical romance, also labeled as inspirational fiction). I found that I was bored and disappointed. After two years of reading only non-fiction books, mainly with the intent of learning to improve myself, I found that I had completely lost my taste for fiction novels. I am glad to know this about myself, because I love that I no longer desire to escape reality by becoming lost in a book. (I know that not all people do this, and many people enjoy fiction in moderation, but I was not one of those people – I always went way overboard.) I now find it much more fulfilling to only read fiction novels with my children – we just finished Charlotte’s Web together this week, and that was an incredible experience to share with my six year old daughter! PS I had a dream last night that I met you in person, at a grocery store, and you were super nice and down to earth, and you gave me a few great couponing tips. I think I’ve had money-saving techniques on my brain lately! I wish we could have met instead of it being a dream — maybe someday soon! That’s funny I dreamed I met billionaire Larry Ellison. One of these days Crystal will probly be a billionaire too but I’m know she’ll be much more generous with her money! I don’t think billionaire is something in my future, but that would sure be fun to be able to give money away to everyone who needed it, wouldn’t it?! When you said last time that you enjoyed reading “non fluff,” I didn’t know you were classing all fiction as fluff! I have to respectfully disagree! Fiction is art, and reading great fiction is nourishing to both intellect and soul. Some people seem to have concluded I think that (sometimes it’s easy to jump to conclusions based upon reading a few sentences in a blog post), but it’s not the case. I just personally have tried and tried to like fiction and haven’t succeeded so far (see my comment above to J). Reading Honey for a Child’s Heart was really good for me — as has been reading fictional books to my children. I’m glad to hear you clarify that you do read fiction children’s book with your children:). There are some amazing books out there. I agree that we must be careful of content and definitely make it books worth reading –not the silliness a lot of kid’s books are now days. Good to Great is a wonderful book. You’ll learn so much from Jim Collins. It’s one of my favorite books. Please don’t label all fiction as “fluff.” You’ll find lots of fluff in the fiction category, just as you will in the non-fiction category. Just take a look at a Bestseller List for any given week. Lots of people were writing novels at the same time as Jane Austen or Charles Dickens or F. Scott Fitzgerald or John Steinbeck. Most of those novels have been forgotten. The gems remain. Good fiction elevates and challenges. Sometimes it inspires. Sometimes it angers. Yes, it often entertains, but it does so while providing insight into the human condition. Oh goodness, please do not think I’m labeling all fiction as fluff. Please read my comments above before jumping to conclusions! As I’ve said many times before, fluff abounds in both the non-fiction and fiction categories. I hope that clarifies things for you and I’m sorry for the misunderstanding! My apologies. It seems I was composing my response while you were posting the other comments. This is just a subject near and dear to my heart. I loved Three Cups of Tea. Not sure what you heard, but I personally thoroughly enjoyed it. It really is an inspiring book, and an example of how we can reach out to those in need. Did you hear that the author of “Three Cups” was recently exposed as a fraud? Sad but true. This isn’t quite the case. Greg Mortenson’s faced allegations that he mis-represented things in his books and that he’s mis-managed funds. If you read the books it’s very clear that he’s a pretty un-organized guy (by western standards) and that he tries to run the organization on his own to the point of fault. The allegations haven’t been fully substantiated, but even if they are, his commitment, goals and spirit remain, which are the most inspirational parts of the book(s). John Krakauer is an excellent journalist with tons of credibility and if he writes that the books are partly fabricated, I’m not wasting my time reading them. I see no problem with you expressing that you prefer non-fiction over most fiction, that’s your taste. I’m surprised that caused such an uproar. Fiction is my favorite, however; I primarily read christian fiction. If your ever in the mood to try some fiction I strongly recommend anything Francine Rivers! My favorite are her Mark of the Lion series, sorta life changing. Francine Rivers is fabulous! Love her books! LOVE Francine Rivers! 🙂 I can’t wait to read her second Marta book!! The All Creatures Great and Small series, by a large and small animal vet in rural England is delightful and suitable for children. The BBC TV series based on the book is availabe and DVD and great fun. I’m in the middle of The Real George Washington. Awesome book. I also recently read The 5,000 Year Leap about the genius of the Founding Fathers. We live in an amazing country! Got a question – I have a nearly 3 and nearly 5 year old, boy and girl, and when I checked out the Amazon reviews/ratings, it seems like those All of a Kind Family (well, and the Little House and Odyssey books too) are for ages 9-12. Of course, I read those books before age 9, but I was suprised to see that they held the attention of you kids, even though you have one older one. I haven’t tried to read books like that aloud just because I’ve been assuming they wouldn’t really understand/care about the story, but maybe I’m wrong. It would depend upon your children. Mine are 6 and just turned 4 and they beg for more chapters, but they are girls, too. I’m not sure if 5-year-old boys would be as into read-alouds. You could try with one book and see how it goes. I’d say to go with the Adventures in Odyssey as that’s more adventure-packed than the other two. However, you may not be able to get it from your library, so in that case, you might just go with the Little House book (since I’m pretty sure you can get it at every library). Let them color or play while you read, use voice inflections and get them involved in the story and they may just love it — or not. I’d love to hear other moms’ thoughts on this if anyone else wants to chime in. Some recommendations for ages on books are geared towards when children can read them by themselves. Other age recommendations are based on the content and the appropriatness of that content for a child of a certain age. As a primary grade teacher, I often read chapter books to classes that are labeled above their reading level; children can often comprehend a much higher level than what they can read themselves. I think that knowing the content is the most important part. Many books for children ages 9-12 would not be appropriate for 6 year olds to hear, but All of a Kind Family is a wholesome series that shares the happenings of a family without any “controversial” issues. Hearing harder books also helps with attention span and gaining a sense of story. Sorry for writing a novel, but this has been my experience. Melissa–I’ve read that the Amazon ages are based on the age at which a child can read the book independently. This is generally several years ahead of when the book can be read aloud to the child. Some thorough book lists will give age guidelines for both categories. I am a mother of 4 and a primary grade teacher. I agree with Anne when she says that the age can often be an indicator of when a child could read a book independently. It is actually developmentally very good for children to listen to chapter books that are a little above their own reading level because they gain learn more comprehension and sense of story than just from books they themselves can read alone. The only caution I have is to always check the content. All of a Kind Family and the Little House books are very sound; many tween/teen books contain content that I would not want a 6 year old to hear, even if it is handled in a Christian manner. It means that we as parents might have to preread if we have never read the book before, read reviews about it, or at least be comfortable stopping if something inappropriate comes up. I just read Unbroken by Laura Hillenbrand. It’s a biography about a soldier during WWII. I really, really enjoyed this book. Biographies put me to sleep and war type books are not my cup of tea, but I could not put this book down. She is an excellent writer and Louie’s story is so inspirational. That book is on my list to read someday soon. I’ve heard it’s good! I just finished reading Discerning God’s Voice by Priscilla Shirer. It was a pretty easy read. (I’m a slow reader and finished it in a week.) She’s really straight forward and very passionate about her relationship with God. Another book I’m reading right now is The Invisible War by Chip Ingram. It’s about spiritual warfare and eqipping yourself to fight spiritual attack. I haven’t finished it yet, but I’m really getting into it. Have a good weekend! Hi Crystal – I just saw Personal Finance: The Missing Manual on your list. I work for the publisher, O’Reilly Media. If you don’t have a copy of the book yet please let me know – I’d love to send you a copy (print or ebook – whichever you prefer). I love your blog – thanks for all you do! Thanks so much for the offer, Sarah! I actually already have it, but I really appreciate your thoughtfulness. I am currently reading Counsel From the Cross by Elyse Fitzpatrick and Dennis Johnson. It’s an excellent book. I highly recommend it. I also can’t wait to read her new book Give Them Grace, on parenting. A good friend of mine is friends wih the authors of Give Them Grace! Our moms group is going to read it together I think! Thank you so much for sharing your reading list! I am the opposite of you and have trouble reading nonfiction books, I am not sure why, I just keep putting them off. But I REALLY want to change that! This post has encouraged me to pick up some nonfiction books. Thanks! I love your book blurbs, they make me want to get up and read. Have you read Ann Voskamp’s “One Thousand Gifts”? I’m almost done, and I’ve loved it! I think you would too, and it’d be a great book to read before the Relevant ’11 Conference! PS– I love Francine Rivers too, and I don’t read much fiction either. 🙂 But I always make an exception for her. “Redeeming Love” was a favorite of mine…it takes place in the American West, and it’s based on the book of Hosea. I love One Thousand Gifts as well. One of my favorites I’ve read in quite some time. I plan to read Chip Ingram’s “Good to Great in God’s Eyes – Ten Practices Great Christians Have in Common.” Have you read this book? I learned of this book as it was promoted on the end pages of another one of Ingram’s books that I just finished. The promo compares “Good to Great in God’s Eyes….” to Collins’ book entitled “Good to Great”. (I hope this makes sense.) I suppose that Ingram’s book could be described as an “inspirational version” of Collins’ book?. Have you read Jim Morrison’s “The Blessed Life”? I’ve just begun to read it as I’ve heard so much about it. Good things. 🙂 Just wondering about your thoughts on it in case you have read it. Thanks for the suggestions. I’ve not heard of either two books and they both sound good! My apologies, but the author of “The Blessed Life” is Robert Morris and not Jim Morrison as I commented earlier. Anyone who liked Alcorn’s The Treasure Principle and is ready for more should look into his book Money, Possessions and Eternity, which is a more in-depth treatment of the same subject. Excellent, thought-provoking reading! I just finished reading The Immortal Life of Hernrietta Lacks which i thought was very good…and I don’t normally read non-fiction! If you already read it, I apologize – I just recently discovered your website. LOVE it! I am just now reading America’s Cheapest Family Gets You Right on the Money, and I am really not enjoying it 🙁 I assume you’ve read the Complete Tightwad Gazette? I don’t have children and a lot of that book is devoted to children’s things, and even with all of THAT, the Tightwad Gazette was more useful to me. Granted, I’m not yet done with America’s Cheapest Family, but the writing style alone is turning me off AND I haven’t learned anything new yet (but I’m hoping I will because honestly, if I learn one new thing, the book would definitely be worth my time!). I’m looking forward to reading your view of this book later in the future. And if anyone wants to read MY review of America’s Cheapest Family, you can visit my blog by clicking my name next Saturday. This book will be reviewed in next week’s “This Book Room”! Thanks for adding the read alouds that you read your children. My kids (ages 2 and 3months) are too young for chapter books, but I’m already collecting ideas for when we can start them in the next year or two. The Traveler’s Gift by Andy Andrews. One of the BEST books I have ever read! So well written too! Thanks for the info! I just ordered Debt-free U and a few others for free using Swagbucks rewards! Our son is starting at the community college this fall and I need to read up, and so does he, on how to pay for the coming years. I think I am a little behind timewise but better late than never! Again, thanks for the info. While it seems based on your responses/comments you don’t like fiction ;)…while this author is fiction..I have come to really enjoy reading her books..if you do decide to try fiction, read Karen Kingsbury…wonderful christian author and she often quotes scriptures. Seeing your list makes me want to branch out of my normal reading routine too! I continue to love and enjoy your post! I don’t know how you find time to read…I fall asleep if I try to read something other than a Blues Clues or Barney book to my kids! I did just check out the new Duggars’ bookfrom the library(I think it’s Blessings Multiplied?). I’m enjoying it so far. I am ordering from Amazon “…Have a new you by Friday…” that you had on your list. I need all the help I can get! It hard being a patient mom somedays. Anybody else find that? Oh Chrystal, don’t let the Negative Nellies get you down … life is too short to read anything that doesn’t bring you joy! I, personally, feel the need to introduce more non-fiction into my reading repertoire. Some of your suggested titles sound wonderful! Finally, I just want to say I’m inspired by the amount of reading you accomplish (and all the rest of what you do!). Thank you for the inspiration. Crystal, have you ever thought about fiction as a learning tool? I have learned so much about so many subjects through excellent fictional works written by authors who really research their material first. Many books that are on Oprah’s list are like this. For instance, I learned a lot about schizophrenia through “I Know This Much Is True”. I learned about the civil rights era through “The Help”. It’s true, that most of the genre fiction out there is total fluff (like most of those authors who crank out 2 – 3 books a year). However, with well-chosen works, fiction can be both entertaining and quite didactic at the same time. Just something to consider! I am inspired by the amount of reading you accomplish. And I’m inspired to add some of your nonfiction titles to my to-read list. Perhaps as your children get a bit older and you read more aloud to them (I’m thinking Little Women for some reason!) you’ll enjoy those and find a fiction author you are inspired to read. Thank you so much for your inspirational posts … I find the really give me something to strive for! Just wanted to let you know about a wonderful company called Lamplighter that finds old and rare editions of quality fiction for children and adults and publishes them again. My husband and I heard the founder, Mark Hamby, speak at our state homeschool conference this year. It is non-profit, and the books are great. Check them out on http://www.lamplighter.net. We love the Lamplighter Theater CDs! A new book that I am loving is “Give Them Grace” by Elyse Fitzpatrick. It is a tremendous book on parenting that is powerfully gospel-centered. Oh my word! I LOVED The All-of-a-Kind Family when I was younger and I’ve been trying to think of the title for months! Thank you so much! Did you know that there are more books in the series? I’m so happy right now that I want to run right out and buy them this minute!!!! Yes, I’m planning to read the rest of the series since the girls have loved the first book so much! Is Debt-Free U only about undergraduate college? It seems like a lot of what I hear about paying for college doesn’t apply to a graduate student with a family. I wonder how much this book could help us. Crystal, you might enjoy the book 365 Thank Yous by John Kralik. It’s about a man in his early fifties who was very much down on his luck (middle of second divorce, his law firm was failing due to non-paying clients, he was being sued, etc). He heard a voice clearly telling him that he needed to be grateful for that which he had. And so John began the year of thank you notes, trying to be appreciative in his life. It’s an amazing true journey, how his being thankful not only affected him, but those around him. It’s not written from a religious standpoint at all, but you as a reader can see God in every turn. And the fact that he begins his journey somewhat athiestically and ends saying that he does attend a church is a miracle in itself. People who normally wouldn’t read anything with God “plastered all over it” would probably easily digest this one. Honey for a Child’s Heart has been lugged to the library with us since my 11 yr. old daughter was two and it was recommended by a friend. We use it to navigate “best” books among all the available books one could never possibly finish in a lifetime, and have started giving it as part of the baby shower gifts for family. We have also found treasures on the “1000 Good Books” list at http://www.classical-homeschooling.org. For the grown ups in the house (nonfiction): Nancy Pearcey: “Total Truth,” “Saving Leonardo”; David McCullough’s history; Walter Wangerin (fiction), and anything by Edith Schaeffer (nonfiction).